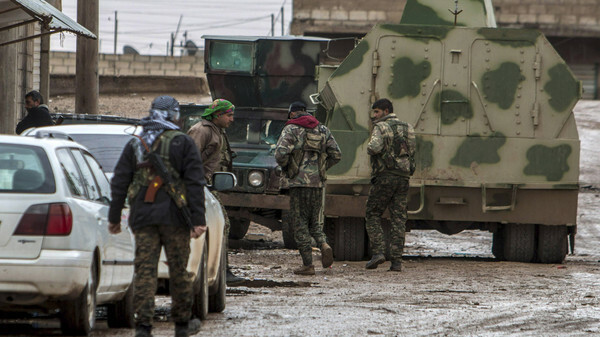 Fighters of the Kurdish People’s Protection Units (YPG) walk past an armored vehicle along a street in the town of Tel Tamr February 25, 2015. ISIS militants have abducted 220 Assyrian Christians from villages in northeastern Syria in recent days, a monitoring group said Thursday, more than twice as many as previously reported. “No fewer than 220 Assyrian citizens (of Syria) were abducted by ISIS over the past three days from 11 villages” in Hasakeh province, the Syrian Observatory for Human Rights said. “Negotiations are under way through mediators from Arab tribes and a member of the Assyrian community to secure the release of the hostages,” the Britain-based monitoring group said. ISIS has seized 10 Christian villages in the Tal Tamer district in the west of the province, prompting a mass exodus of civilians, the Observatory added. There were 30,000 Assyrians in Syria before the country’s civil war erupted in 2011, most of them in Hasakeh. At that point Syria had an estimated Christian population of about 1.2 million.